The discovery of new bones belonging to a long-necked sauropod named Austrosaurus mckillopi has been announced by a team of Australian and British palaeontologists. The bones date from the Early Cretaceous period (104-102 million years ago) and were first discovered in 1932 on Clutha sheep station, northwest of Richmond, Queensland. However, attempts by palaeontologists to relocate the site during the 1970s and 1990s failed. 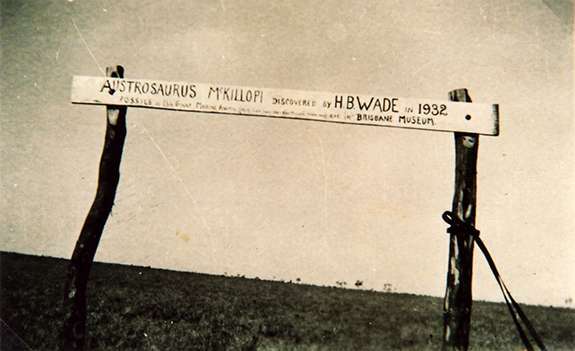 Swinburne palaeontologist Dr Stephen Poropat became intrigued by the mystery of the lost site when he studied the bones uncovered in 1932, currently in storage at the Queensland Museum. "When I realised that the backbones at the museum probably formed a section of a dinosaur's spine, I hypothesised that more of the skeleton was waiting to be found," Dr Poropat says. In 2014, he contacted Dr Tim Holland, former curator of Richmond's Kronosaurus Korner marine fossil museum, about relocating the site. Dr Holland enlisted the help of Richmond Mayor John Wharton – who grew up on Clutha station – to find the lost site and, hopefully, more of the skeleton. "When we failed to find the Austrosaurus site at ground level, John jumped into his helicopter," Dr Holland says. "From the air we spotted two wooden posts – both of which had toppled over – that had once supported a sign marking the spot. John then found fossilised portions of bone embedded in rock nearby. We were blown away." Three digs at the site between 2014-2015 uncovered six rib bones, which when placed with the vertebrae found in the early 1930s created a more complete picture of the dinosaur. "The most exciting realisation was that portions of the ribs were embedded in the rock surrounding the left side of the backbones," Dr Poropat says. 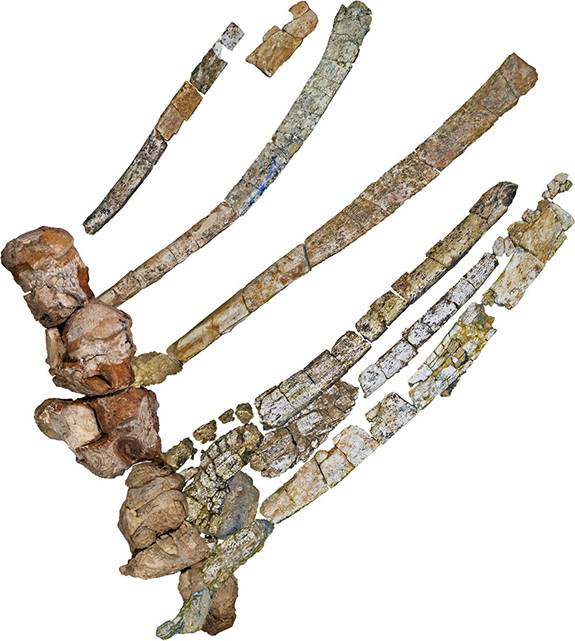 "This matched the ribs that we found in 2014-2015, five of them from the left side too. This means that the carcass of Austrosaurus came to rest on its left side, and it was not shifted much after it died allowing the bones to stay close to a life position." Because of its age, Dr Poropat says Austrosaurus might reveal something about the evolution of other sauropods in Australia. "The sauropods commonly found in the Winton area, south of Richmond, lived five to ten million years after Austrosaurus," says Dr Poropat. "This means that Austrosaurus could potentially be their close relative or even their direct ancestor. Unfortunately the bones are too incomplete and poorly preserved for us to be able to say much with certainty. Nevertheless, we can tell that Austrosaurus was at least distantly related to Winton's titanosaurs like Diamantinasaurus and Savannasaurus since it shares some features with them." Although the Austrosaurus site is now believed to be exhausted of fossils, the potential for future discoveries of important fossils in the Richmond area is huge. "Rocks of the right age, deposited in a Cretaceous inland sea known as the Eromanga Sea, are close to the surface all over the Richmond region," says Dr Holland. "Who knows what else might be waiting to be found? 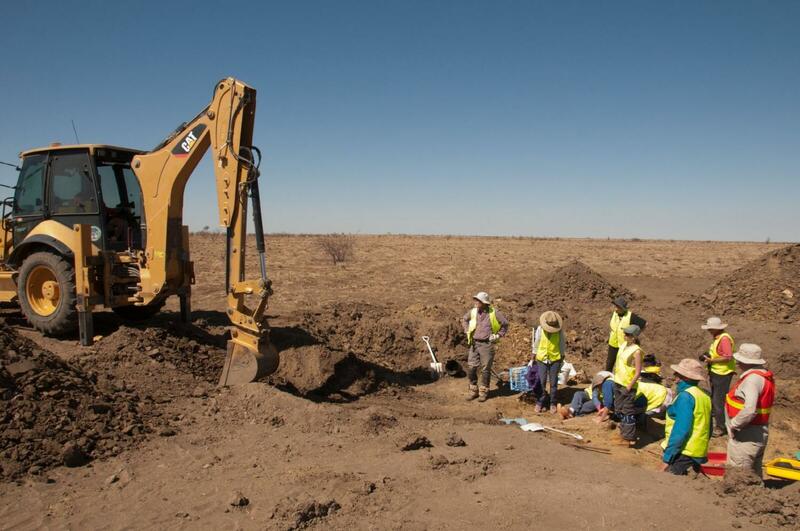 A lucky discovery by a grazier, fossil hunter or tourist out there might be a game-changer." The new research on Austrosaurus has been published in Alcheringa, an Australasian Journal of Palaeontology.